You can start working with our mobile-app by creating a primaERP account. 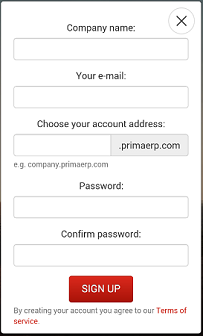 If you already have a primaERP web account, you can log into the mobile-app using the same login credentials or you can also log in via your connected Google or Twitter account. When you start working with the mobile-app, an access token is created in order to sync the data between the web-app and the mobile-app. In case your mobile device is lost or stolen, you can access the web-app and delete the access token; this way the access to your account via the mobile device will be terminated and once the deleted access token's validity is expired, the data stored on the device will be deleted. This guarantees the security and the control of your data. 1. Sign up: The mobile-app allows the creation of a new primaERP TIME TRACKING account, which will be accessible both via our web- and mobile-app. During the sign up process, the app will require a few details such as: name of the account, your email address and a password - the same data, which is needed for the registration via the web. Please notice that a internet connection is required to create the new account. 2. Log in: If you already have a web account created, you can log in to the mobile-app using the same log-in credentials. When you log in for the first time, the initial synchronization may take some time. Note that the first log in requires an internet connection. 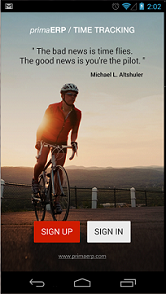 Once you are logged in, you can start working with the mobile-app even while being off-line. Note that your account will remain logged in and will synchronize the data until you log off. Logging off will reset the mobile-app, thus clearing all the data off the mobile device; however you can recover it by logging in again. This action is recommended only in case of malfunction of the mobile-app. 3. Log in with Google or Twitter: In the same way as in the web-app, you can log in using your Google or Twitter credentials. We should remind you that in order to log in with Google or Twitter on the mobile app, you should be connected to the Services in the Web App first. Once you connect to those services, you can log in by only entering the name of the account. When you are logged in, your account will remain connected and synchronize the data until you log off.